One year ago Sergio Marchionne and his guys presented the first investment plan of Fiat Chrysler Automobiles. 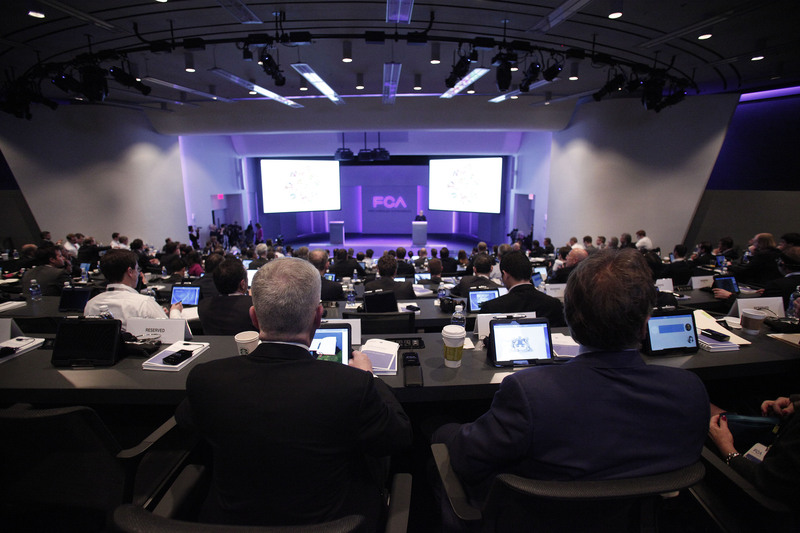 The new car group, which was born 4 months before, was finally presented as a whole with a very detailed product and sales planning that is supposed to be the guideline for FCA for the next 4 years. One year later the group keeps consolidating its global operations, with good results in some markets, serious threats in others, and many new cars still to come. This analysis intends to make a recap of what it was said during that meeting, analyze the current situation and compare it to the 2018 targets. The brand sold 15.000 units in Europe in 2015-Q1, down 6%. In 2014 its European registrations totalled 59.000 units, down 8%, out of 65.000 cars sold worldwide. The brand keeps posting negative growth due to the lack of new cars and the old current range (the 4C didn’t even account for 5% of total sales). This year total sales are expected to reach around 60/62.000 units, which in the best of the cases would be very far from 2018’s target of 400.000 cars worldwide. The brand gets ready for the presentation of the D-Sedan to be revealed in Arese museum, near Milan in late June, and which is supposed to be the first product of the new global Alfa Romeo (with a new logo too). The presentation of the new car will take place in different steps and locations as the brand wants to concentrate the attention for the next months till it goes on sale in early 2016. Therefore at Arese they will show the top-version with more than 450 cv, V6 Ferrari engine and priced at 90.000 euro. This version is supposed to be the direct rival of the BMW M3 and Mercedes-AMG C63. Then during September at Frankfurt motor show, the brand will show the rest of the range with prices starting at 35.000 euro. In other words the new Alfa D-Sedan will start its deliveries during the first half of 2016 in both, Europe and USA. Meanwhile the Giulietta and MiTo will get even older, and the D-SUV could be presented in any American auto show (NY? Los Angeles?). This means that by the end of 2016 the brand could be selling around 50.000 units of its MiTo and Giulietta, 2.000 4Cs and an estimated of 40.000 D-Sedans during its first year. If the D-SUV goes on sale in late 2016, and the Giulietta is completely updated in 2017, along with the arrival of more versions/variants of the D-Sedan, then the brand could reach around 180.000 units (90.000 D-Sedan/SW, 50.000 D-SUV and 60.000 Giulietta). By the end of 2018, when FCA targets 400.000 units for Alfa Romeo, the Arese guys could be selling around 350.000 units thanks to an increasing demand for the D-Sedan/SW (140.000 units), the new Giulietta (80.000), the D-SUV (100.000) and the new E-Sedan (30.000). These numbers are just my own estimations based on the brand’s product plan, and the success it will have in North America. One year after the product plan announcement, the brand relies on 3 models with very low demand, has a marginal presence in USA and is preparing the presentation of one of the most expected cars in the industry. In terms of sales, the figures indicate that the gap between the actual and the target increases as the time reduces. Source: FCA investor day presentation. 2014 was a great year for Maserati. They were able to sell more than 36.000 units, when 3 years before the Tridente brand wasn’t able to deliver more than 7.000 units/year. The big jump took place during 2014 thanks to the Ghibli sedan, which counted for 64% of the total. The strategy of enlarging the luxury to lower segments had a positive effect not only in volume but in profits. 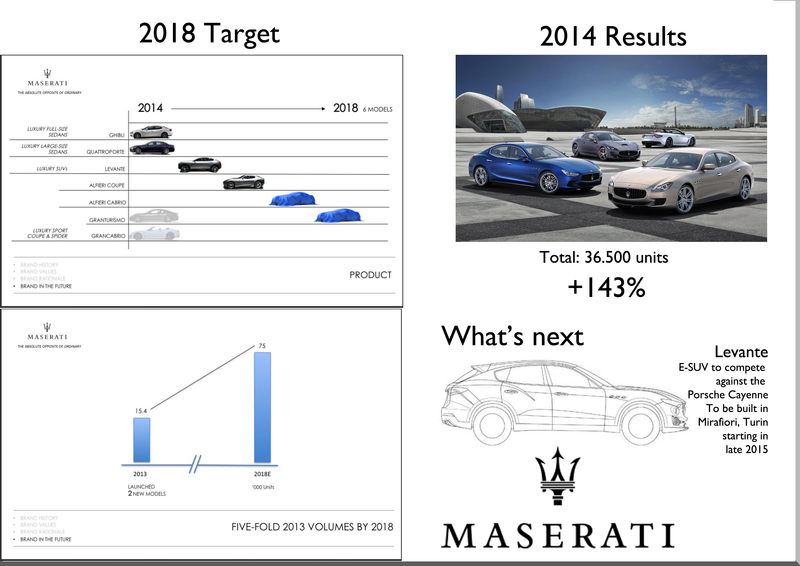 In May 2014 the head of the brand, Mr. Harald Wester, said that Maserati would reach a total sales volume of 75.000 units which is a bit more than double of last year’s results. This will require the arrival of new cars, as the Ghibli and Quattroporte have already reached a sales peak based on this year’s sales figures (Maserati 2015-Q1 sales decreased 9%). Therefore the new Levante E-SUV will help the brand to keep growing but not before 2016 as it is expected to be revealed at 2016 Detroit motor show and be available in 2016-H2. Then will arrive the Alfieri Coupe and Cabrio but as it happens to the GranTurismo/GranCabrio they are not expected to generate big volumes. Contrary to Alfa Romeo, Maserati’s goal seems to be more achievable. However it all depends on how successful the new Levante can be, and how the brand will deal with the Ghibli and Quattroporte during the next 3 years. The SUV, to be built in Mirafiori plant starting late 2015, can easily overtake its sedans brothers just as the Porsche Cayenne has done within the Porsche car family. The problems may come from China where the market cools and the Maserati sedans demand may have troubles. One year after the investor day, Maserati heads steadily to the target, is more global, known and better qualified to fight against Porsche, but faces some short-term challenges that can be somehow managed with a SUV. The world’s most valuable car brand will be no longer part of FCA as there will be an spin-off in the third quarter of this year. Months after the investor day, Marchionne announced that Ferrari will be separated from the core of FCA business, while he replaced Luca di Montezemolo as the chief of the brand. The change on the management is related to Marchionne’s idea of making of Ferrari an exclusive car brand for its clients, without excluding the potential ones. The CEO believes that there is still room for more supersport cars as there are waiting lists of more than 1 year for a Ferrari. Therefore he intends to increase annual production to 10.000 units keeping the exclusivity (+3.000 units over current standards) but rising total profits, without hurting the core of the business which means the absolute opposition to any sedan or SUV using the Ferrari logo. 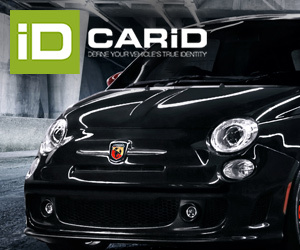 The focus of Fiat brand presentation at the 2014 investor day was the “Two of a kind” concept. Olivier François, head of the brand, talked about this two different worlds inside the brand that should lead Fiat’s next years. The idea is to create the functional/rational family, composed by those mainstream products that are well-known for being good, comfortable and cheap cars, such as the Punto, Panda or Uno, and the aspirational family which is composed by the upper mainstream cars, aka 500 family. One year ago the brand promised the new 500X (on sale since January 2015), a refreshed Punto for India (already available) and a facelift for the Brazilian Uno (on sale since last year). For 2015 they also promised the Ottimo Cross for China (presented last month), the compact sedan (to be presented at Istanbul motor show in May 2015), the specialty (which is the new Fiat 124 Spider, to be presented in late 2015), a new city-car for Brazil (nothing ready yet) and the first compact pickup (work in progress). Today the situation of Fiat brand is a mix of good and bad facts. European division (which is not expected to increase its sales by 2018) improves thanks to the 500 family only. The 500X was added bringing good results but still far from the leaders of its segment. The 500L demand isn’t as strong as before and Marchionne points at no mass-market cars, but Turkish plant gets ready to introduce the compact Aegea family: sedan (2015), hatchback and SW (2016). The Panda, at its 4th year hasn’t received any important update, while the Punto dies in Europe’s largest segment. In 2014 the brand kept its 10th position in the European ranking by sales with 580.000 units, up 2%. This year (2015-Q1) things get better with sales up 8,3%, in line with market’s overall. The bad news come from overseas. Brazilian Fiat struggles to sell its old products in a market that drops 18% during the first 4 months of this year while the Pernambuco plant is supposed to get ready for the production of the new city-car. Things aren’t better in Argentina, where the brand posted a 31% drop during Jan-April 2015. The falls follow the bad economic situation in these two important markets and are becoming the new headache of FCA after years of crisis in Europe. One year ago the situation wasn’t as bad as it is now and analysts didn’t expect the Brazilian market to deteriorate. 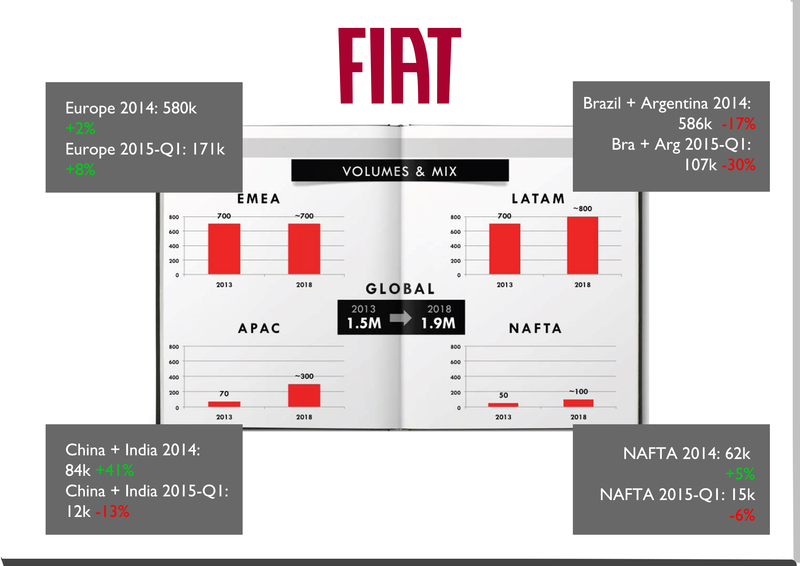 However, the Fiat management wasn’t expecting a big jump for the brand in Latin America: from 2013 to 2018 total deliveries should grow 14% from 700.000 to 800.000 units. 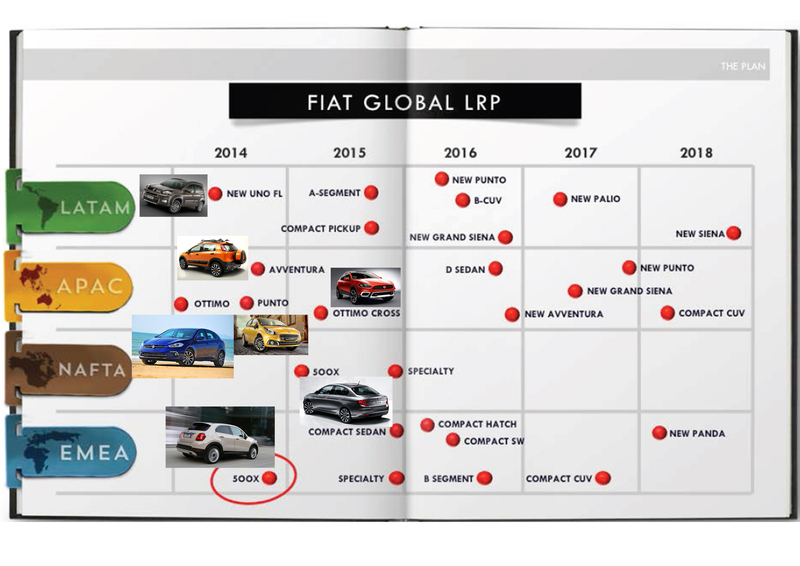 The brand sold around 600.000 units in 2014 (excluding the pickup line, which is considered part of Fiat Professional). In APAC things aren’t good either. The Chinese Viaggio and Ottimo don’t take off and their sales fall continuously since November 2014 (Viaggio) and February 2015 (Ottimo). Fiat presented the Ottimo Cross SUV concept at Shanghai motor show as a way to make part of the SUV boom, but it won’t be available for months. During the first 4 months of this year, the brand demand dropped 39% in a market that shows signals of slowdown. In India the reduced and aging range has also a bad effect on sales. The refreshed Punto doesn’t seem to perform well not even with the arrival of the Avventura SUV-wanna-be , while the updated Linea isn’t a hit at all. The brand sold 42% fewer cars during the first 4 months of this year. Despite those bad numbers, Fiat wants to sell 300.000 units in APAC region by 2018. If they don’t invest in new products in India and don’t launch a SUV/Crossover in China, it will be quite hard to meet that goal. Finally in NAFTA the brand sold 62k units in 2014, up 5%. The situation gets worse during 2015 due to the lack of new products. The new Fiat 500X is expected to hit the dealers in the coming months so by the end of this year this negative trend should be reversed. It is feasible to sell 100.000 Fiats in North America by 2018 with the introduction of the 500X, 500X Abarth and the updated 500. Jeep is the brand that better follows the company’s guidelines. The SUV maker is not only performing well in North America but in every market it sells its cars, with triple-digit growths in many of them. Worldwide consumers want SUVs, small, mid-size or big, and Jeep is there to respond to the increasing demand with a complete range that goes from the B to the E-SUV segment. By the time Mike Manley, chief of Jeep, presented the Jeep objectives, the new Cherokee confirmed it was a real success in America, the Renegade was ready for action, and the Grand Cherokee and Wrangler were posting good results. They also modified 2014 sales target to 1 million units and it was perfectly achieved with 1.017.019 cars delivered worldwide, up an amazing 39%. 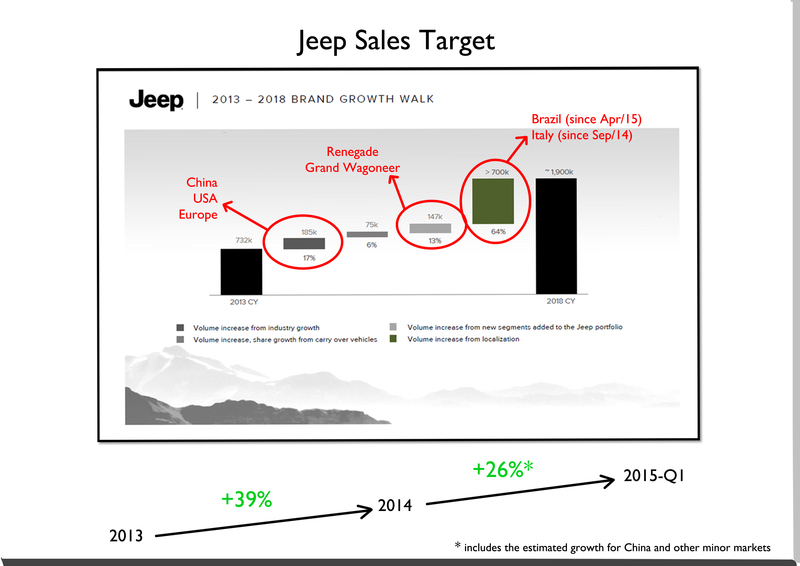 My own estimations for 2015 full year are that Jeep will sell 1,25 million units this year with the US ranking first with 800k units, followed by China and Europe (100k units each), 80k units in Canada, 35k in Australia, 30k in Brazil, 30k in Mexico and 75k in the rest of the world (South Africa, Japan, Russia, Turkey, Chile, Colombia, Venezuela, South East Asia). That makes the 2018 goal even more achievable as the brand wants to sell 1,9 million units that year. Achievable doesn’t mean easy. Jeep faces 2 major challenges. The first one is its poor presence in the popular C-SUV segment due to the aging Compass and Patriot, which will last for at least 1 more year or more due to the fact that their successor will not arrive before the second semester of 2016. Hence it has to deal with two old nameplates in a key segment for at least 18 more months, while in markets such as Europe, VW is just about to launch the new Tiguan, Renault just revealed the Kadjar and Hyundai prepares the new Tucson. The second big challenge is to conquer Brazilian market with the Renegade just when car sales are in free fall. The brand counts on a very modern plant with installed production capacity of 250.000 vehicles per year (this includes other 2 models to be added next year). In other words, the new Renegade arrives in the wrong moment to the Brazilian scenario and Jeep must prove it can not only gain awareness but it must sell a car that is priced pointing to the small middle and high-class. The new 200 sedan is the first step of the new Chrysler brand. Its demand levels show that the car is well received by North American clients, despite the fact that till now most of its sales are coming from car rentals, with a bad effect on profits. Chrysler’s small range is due to be enlarged shortly with the presentation of the new large minivan, which is expected to be a top-seller, featuring the very first hybrid engine of the group. Due to the current intervention in the plant that produces the Town & Country minivan, sales in the US and Canada may be negatively affected by the end of this year unless the new 200 sedan keeps growing in sales offsetting the minivan’s drop. However this year the brand shouldn’t grow a lot and it leaves the next 3 years with a big pressure on the target’s achievement. Chrysler wants to sell 800.000 units by 2018 thanks to the introduction of a compact sedan (Chrysler 100), the new generation of the Town & Country and an E-SUV before the end of 2017. A new Chrysler 300 and a D-SUV will add sales numbers but only during the last months of 2018. In other words most of the tough work will rely on the current Chrysler 200 and the new Town & Country. To reach 800.000 units by the year 2018 will be certainly a very tough job. Sales will be more dependent on the Journey (to be replaced in late 2016) and the new Caravan, which is supposed to have a SUV/Crossover positioning. According to FCA plans, US Dodge sales, the brand’s largest, are expected to have a very moderate growth jumping from 574k units in 2014 to 600k in 2018. Last year sales totaled a bit more than 700.000 cars, down from almost 750.000 units in 2013. 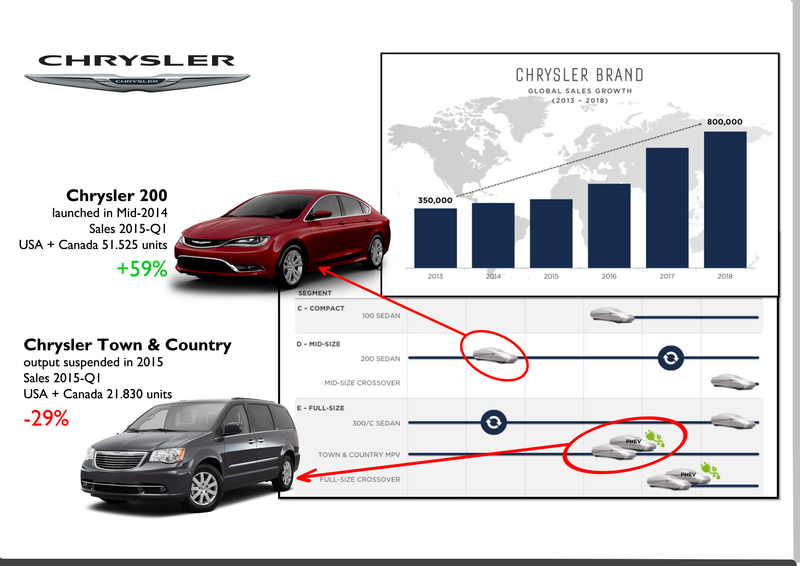 The total goal for 2018 isn’t clear but if its US sales are not expected to grow as much as its sister brands (due to the fact that the brand will eliminate the Grand Caravan nameplate), then total sales by 2018 won’t be more than 720.000 units. Italy’s production of premium/semi-premium cars had already started with relative success for the Maserati sedans and the B-SUVs. 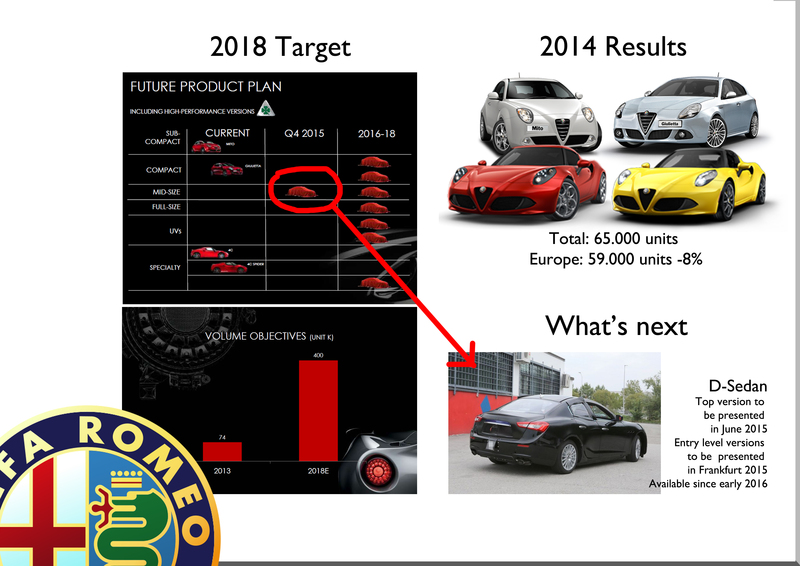 Alfa Romeo new products will join them with exports to the USA and Canada to grow dramatically within the next 2 years. Current Euro-dollar exchange rates favours European exports. Turkey gets ready to boost its production thanks to the compact family, to be sold in Western and Eastern Europe and to improve the leadership of Fiat brand in that country. Serbia’s production relies on the declining success of the 500L in Europe and its possibilities to export to a troubled Russian car market. Poland is supposed to focus on the next Fiat 500 generation and the 5-door version for the whole world, but this won’t happen till late 2016. The US market could go as high as 17 million this year, but is probably that total demand won’t break the 2000 record of 17,8 million cars soon. This means that as a mature market, the coming years are not expected to generate the spectacular growth of the last months. FCA is the big car maker with the highest sales growth thanks to the Jeep and Ram brands, and the big rebates on Chrysler and Dodge brands. The group will have a very important event with the introduction of the first hybrid car to be launched within a year. The situation is quite dramatic: the macroeconomic problems in Argentina and Brazil have reduced the demand for cars as the unemployment rate grows. Fiat brand continues to lead the Brazilian car market but its sales fell more than its immediate competitors. Things get worse when considering the new plant that started the production of the Jeep Renegade a month ago, just when there are fewer clients and the market doesn’t bottom out yet. It’s the group’s main problem and is one of the reasons why Marchionne is looking for another partner. Chinese and Indian market share is really low and things could only improve with the arrival of the locally built Jeeps. If the group doesn’t accelerate the launch of this brand, APAC won’t be able to achieve its goals. Hi Juan, was expecting a big new post from you, and here it is! Thanks. You really are spot on, as far as I too can make out, especially your sense that (a) the US/NAFTA market’s surely near its top (b) the situation in brazil/LatAm is awful but may’ve bottomed out? and perhaps the Pernambuco will become a big exporter of small jeeps and/or the SUSW pickup to the US and/or Europe? and especially (c) APAC is the big hole till the local production of Jeeps and Fiats begins and increases. It is a fact however that Marchionne may’ve set impressive-sounding, ‘stretch’ targets that they have little intention of meeting by 2018, since it seems above all he will want to ensure capital-efficiency, better profit margins, better quality all-round including dealers and after sales service, and hence all the talk of mergers/consolidation etc. I hope they don’t delay the end-2016 date for the local manufacture of the Jeep C-Suv in India (also for exports), since Jeep can and will sell profitably well enough here, while the ‘fiat’ brand really really struggles, i even fear terminally! Do you fear that Europe will see a double-dip recession again, soon? Great as the FCA momentum and direction is, I for one do fear a long-term, volatile, crisis-prone global recession, this time also including the US (again) and even china, perhaps even India. 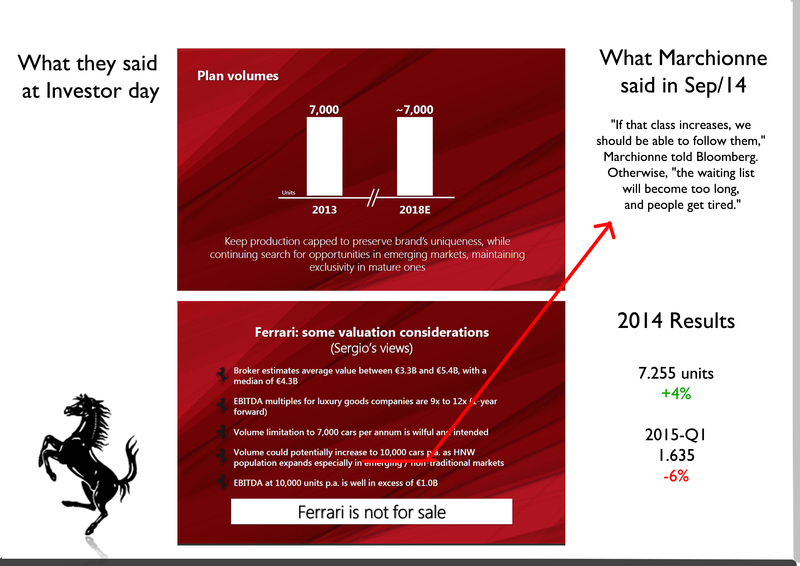 In which case all of Marchionne’s visionary-yet-pragmatic big bets are off! Which is probably why Marchionne and Elkann seem to be desperate to strike merger/tie-up deal(s), before it is FINANCIALLY too late? Right. As most of these goals seem to be hard to achieve, Marchionne wants a partner not only to save money but to make all what he said one year ago. Also, a ‘review’ of the 500X including your sense of how its faring sales-wise in EMEA, relative to targets/potential as you see these? At some point. Sadly i am marooned here in India as an FCA fan, and must wait patiently till end-2016 at the earliest for worthy all-new launches from Fiat and Jeep, it seems!.